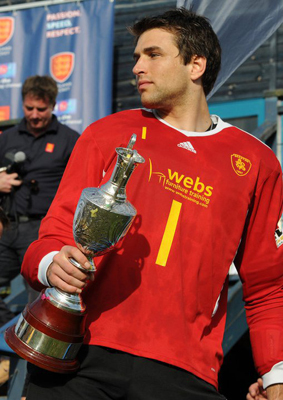 ← England Hockey League Men’s Premier Division: East Grinstead 4-3 Surbiton. England Hockey League End of Season Play-Offs: Part 1. This weekend is the beginning of the EHL End of Season Championship Play-Offs. With the best five teams in the country set to battle it out for supremacy these games are of huge significance. The Top of the D takes you through the teams involved. The first tie is Beeston vs. Reading. The Bees, who of course shocked everyone by defeating East Grinstead in the final of this competition last season, go into their match with 3rd-placed Reading on a good run of form. They haven’t lost in the league since the fourth of December, that game a 3-1 home defeat to, you’ve guessed it, Reading. Their last seven games have yielded five wins and two draws, most notably an 8-6 win over top of the table East Grinstead. Beeston boast one of the most talented sides in the league and on their day, as they have proved, they are capable of beating anyone. Key Players:The obvious answer would be to name the contingent ofGreat Britain internationals: Ali Wilson, Adam Dixon and George Pinner all undoubtedly make a huge difference to the Bees. However, it would be foolish to ignore the contribution of Martin Jones, himself an ex-international. Jones’ experience and ability has been a huge asset to the Nottinghamshire side since he joined them.They tend to share their goals around, but Patrick Schmidt has bagged the most, notching 9 league goals this time out. Expect him to play a key role also.Reading Hockey Club:As mentioned above, Reading go into this play off game knowing they were the last side to inflict defeat on Beeston in the league. Their own form has been p atchy since Christmas, drawing 2, losing 2 and winning 3 of their last seven games. One of those games was an 8-1 home drubbing at the hands of East Grinstead, the day after Reading had thrashed Bowdon 7-1. It would be fair to say the ‘Ding have not been at their best this half of the season, but one thing you can count on, is when the chips are down and the big occasion comes along, the Sonning Lane club always turn it on.Final League Position: 3rd. Key Players: Experience is one of the key factors in Reading’s success. Many of their players have seen it all before. It is hard to look beyond the Mantell brothers, Simon and Richard. Richard is an imposing presence in the heart of the defence and a massive threat from penalty corners, scoring as he has 9 goals this season. Whilst Simon has chipped in six league goals, his individual ability has the potential to be the difference between teams in a tightly fought contest. Of course it would be wrong not to mention top scorer Andy Watts too, six goals from open play and four from corners show his poacher’s instinct could prove to be vital. The winner of this tie will play East Grinstead on Sunday. Part two of the preview will follow tomorrow.